Catching up with The Toy Chronicle! We thought it would be fun to interview those that cover us all the time. We want to learn more about the other essential parts of our amazing scene, the blogs! These hardworking bloggers spend countless hours finding info, editing images, and getting news out there ad nauseam, and we thought it would be good for everyone to get to know them as we have! Along with some of our own questions, we asked our forum members what they wanted to hear, and we got a good bounty of questions. Now without further adieu, we have our first in our “Catching Up” series with the UK’s very own Gary and Andy of THE TOY CHRONICLE! now go ahead and bookmark them and follow them on all social media! Up first, how about you tells us a little about yourself? Andy – Eat, Eat, Eat and Eat – I take photos of my food like 96% Asians do. I am a chef by trade, working silly shifts with anti-social hours. I love toy photography and my number one hobby right now. The main reason is to lose myself within toy photography and not think about anything in the real world. Most of the time expressing my feelings through my photography. With the lack of a good education I still to this day why I write for The Toy Chronicle my English is so bad! Oh, I am also that ‘One Dickhead’ as some refer to me as. Gary – I like D&D, Audrey Hepburn, Fangoria, Harry Houdini, and croquet. I can’t swim, I can’t dance, and I don’t know karate. Face it. I’m never gonna make it. So I started to collect Vinyl toys. Collecting felt right. Felt good. 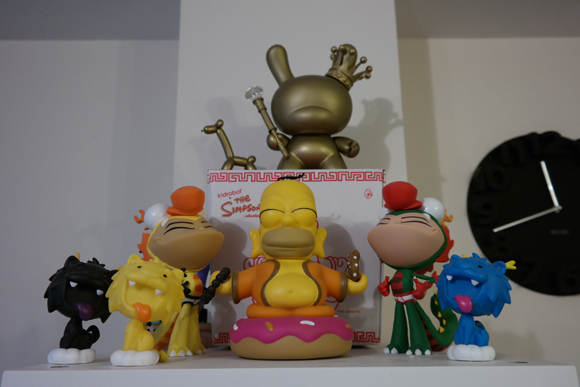 Can’t go wrong with collecting Vinyl toys – right?! My bank manager/girlfriend would strongly disagree. Between us both, along with the help from a crack team of commandos, we are The Toy Chronicle (http://www.thetoychronicle.com/). We started TTC back in late 2013 to mainly focus on the UK/European Designer Toy market. Giving our spin on what’s going down. Maybe introduce more people to get involved in the scene. It has been a crazy 18 months since we formed this coalition of beautiful minds, but we wouldn’t change it. We hope to continually grow, getting our name out there to more collectors. We want to be the first place that people think of when they think of Designer Toys. Aim big or go home. What got you first into this world of toys and art? Andy – Instagram and Facebook got me into it but discovering the world of vinyl toys would have to be my younger brother giving me a vinyl toy called CI Boys (http://www.vinyl-creep.net/CI_Boys) then a few weeks later something called a Dunny! Having something in a blind box and costing in those days around £6 a blind box wanting to rip open a box and find a design I liked looking at the box art and having no clue who the designer was. The buzz from opening a blind box and chasing a design I wanted that was the addiction starting flow through my veins. Gary – Yup, I agree Andy. Blind boxes. The joy of not knowing what you’re going to get. Whilst I have personally moved on to more custom pieces in my collection, I still get the excitement when I’m picking up new blind boxes. I touch a Blind box, I have to have that one. No excuses. What happens if it’s the 1/200 Chase? I can’t risk that. I have to have it. Also I can’t be the only one to get a hit from the fresh smell of vinyl? That was another big spark that got me wanting more. What is the scene like in the UK? Gary – The UK scene is really growing. Growing fast and we love it. More artists getting recognition. More collectors building impressive collections. Take ToyConUK (http://toyconuk.com/) for example, the biggest day in the UK Designer Toy calendar. TCUK started back in 2013 with 200 excited ticket holders having a great day, surrounded by the crème de la crème of UK artists. Fast forward to 2014 and the number of ticket holders doubled. 400 ticket holders. More great artists involved. Some awesome exclusives available. With the third annual TCUK fast approaching (April 25th, buy your tickets here: http://toyconuk.com/tickets/), expect even more tickets sold. Even greater artists. Oh and you’d better believe – even ‘awesomer’ exclusives too. Who knows what TCUK 2016 will bring! Andy – Yeah, the scene is growing pretty darn quick, much quicker than expected really. 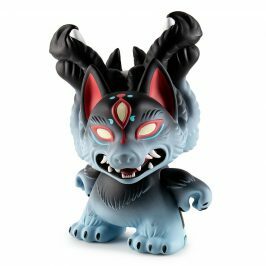 I think the UK economy picking up helps for the collectors and a number of lesser known artists are picking up art toys / designer toys whatever you want to call it. Like Gary said, look at the line-up for this year’s TCUK – new and old artist want a place to showcase their work and be a part of the UK movement. In your opinion, what art toy, specifically, has been the most important or iconic to the art movement? 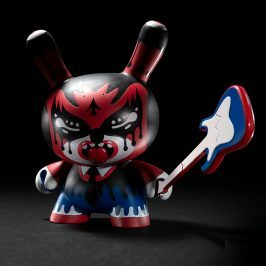 Andy – For me personally this has to be the Dunny or the Munny – hands down! Still no design has anything as iconic as those. The design in both are pleasing to the eye, great for customisers & artists to use as a canvas. Cute, yet it can also be turned into something totally different. Yet collectors will always recognise the shape. One of the most versatile platforms to date and still for me personally the crown is still on the Dunny platform. 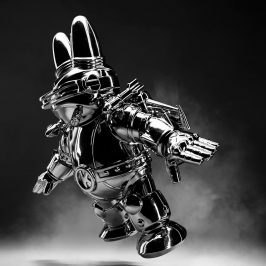 The Dunny was a link from the founders of vinyl designer toys from the East, connected with the West and now are joined globally opening a gateway to unknown artists to the whole world. 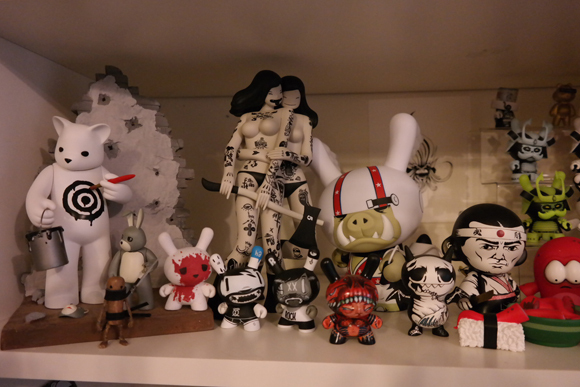 Gary – I’d have to say the Kidrobot Dunny too. For me the Dunny is the most iconic art toy in our scene. As Andy says, it is easily recognisable. 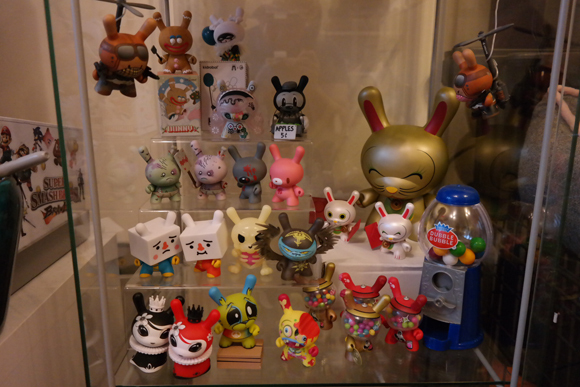 The Dunny has been the gateway in to the scene for most collectors I know. You would start with a few blind boxes, increasing your collection and getting to know the artists involved in creating these 3inch vinyl goodness. Before long you’re dropping a couple of hundo on a JPK custom Penny McStompsalot 8inch Dunny. The addiction has set in. You have an itch to scratch, only the Dunny can provide that satisfaction. Viva la Dunny! What was the coolest moment you’ve had since you started reporting on the toy world? Gary – Building up The Toy Chronicle name has certainly opened up the door to being noticed by some big hitters in the scene. So meeting Huck Gee on my visit to San Francisco (http://thetoychronicle.com/interviews/the-toy-chronicle-meets-huck-gee/) earlier this year was a mega highlight for me. Huck is right up there as one of the top dogs in the Designer Toy world in which we all exist. So getting to sit down & chat with him, get to see his studio was pretty ace! Andy – Being nominated for the Best Blog award at the Designer Toy Awards 2014. That was an amazing achievement for us. We were up against the very best of the best in Designer Toy blogging. Within the first year of our existence. Pretty impressive for us. It made me realise that it wasn’t a waste of time. Andy – Luckily we have a few readers & supporters of The Toy Chronicle that have helped us in the past to gain coverage for other Toy Cons. For example, Popcon Asia in Jakarta last year, we sent one of our supporters over to get some coverage of the Con. We wanted to do something a little different, rather than just news, news, news. We wanted to get a view from a non-collectors point of view and how they see a Toy Con. Hopefully in the future we can gain funds to actually be at most of the cons in person or at least have a representative at the cons. Nothing quite like a personal touch and meet & greets. Gary – We’d love to attend more conventions in person ourselves. Designer Con, NYCC, SDCC – get in touch :) Free beard hugs to anyone that can get us over there. Spanky has Stroll. Would we ever see the mascots from VP, The Toy Chronicle and ToysREvil realized in physical form? Gary – The Stroll for us is one of the most quintessential images of the Designer Toy scene. Everyone knows the Spanky Stroll. One day we’d love to have something as iconic as the Stroll. We have recently commissioned the incredible artist Mr Lister ) to redesign The Toy Chronicle logo to give us the options in the future. So hopefully. Who knows? We also have a cool concept coming up at ToyConUK that will see artists give us their rendition of the TTC logo. We’ve already seen some sneak peeks and we’re dead excited to reveal more as the days tick by until Saturday April 25th. What’s the favorite part of your job? Being the first to know? Being the place collectors come for news? Andy – For me it is less recognised artists saying a simple ‘Thank you’ and watching their fan numbers grow and they move on to bigger projects. Being first to know for me personally is not much of a buzz for me. Knowing something that no one else knows might seem cool but in fact most of the time they will forget about it till they see the full release details. 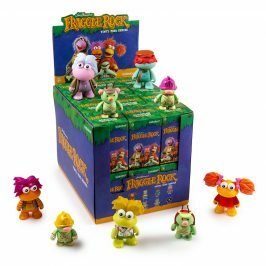 Gary – I agree that the best part of the job is getting news of the lesser known artists out to the masses, which is why we set up The Toy Chronicle in the first place. We wanted a place for folk to visit, catch up on their vinyl art news but also to find something new. The buzz we get when the unknown artist get huge praise from our readers, these artists appreciate the exposure they get. I think some of the bigger, more well-known artists can sometimes take this for granted at times, but you don’t sense that from the smaller artists. Seeing their work being given the opportunity to be seen by thousands of eyes excites them. We love that. Long may that continue! 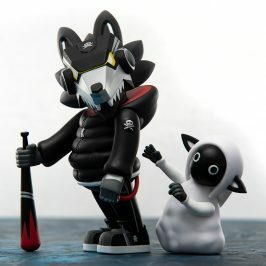 Where do you think the vinyl toy scene will be in the next year, 3 years, 5 years? Andy – Next year will be rise of the resin/ home-made figures, platforms etc. As the rise in the vast amount of media, from How-to-Do videos to forums to groups, grows, people will always try and get a piece of the pie. Armed with some Sculpey and some paint, people will be launching their own online shops full of resin. In 3 years, hmmmm, I think the East will have a bigger influence on the Western market. Quality Sofubi being noticed in the last few years. I think a fair few collectors will move on to Sofubi and also collect more custom toys too. 5 years, wow I really don’t know. I hope the bubble doesn’t burst. Also more Fine Art artists getting involved. Gary – 3D printing technology will definitely play a bigger part in the community, over the course of the next few years. For certain. I think that artists need to spend some real time making a quality product. Don’t rush your first few designs to market. You will only benefit by making it better over time. A sub-par piece of art won’t get you the notice you deserve. Oh and let’s not forget about the rise of Kickstarter etc, which has made it easier for artists to get their works produced. Again, crowd sourcing may not always be the answer but we’ve seen this year that in the right situations it can be a great tool for an artist to use. You just have to use it right. Don’t abuse the platform. What is your honest, unbiased opinion on resellers? Andy – Flippers? making a profit I can understand but it is so frustrating me personally seeing something being flipped, someone like me staying up all night and F5-ing like a crazy nutter only to find out my connection was too slow or not as quick then then following day its up for sale on Evil bay for double the money. Not a good feeling right? I guess in everyday world, money always comes into play. Maybe a flipper wants to make profit, to fund his own collection? Who knows? All I know is the world is unfair and will continue to be. Don’t cry, if something is worth it you will pay for it. Gary – Unfortunately, it is all part of the game we play. It’s not always fun when you’re looking to get hold of a certain release and they’ve sold out, yet you find them within minutes being flogged on eBay for double the original price. You are never going to be able to stop folk flipping releases. You have two options, accept that fact or be quicker with your F5 button when pieces drop. 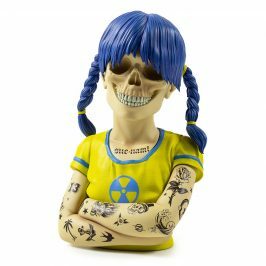 Since toy blogging means you are continuously aware of a very broad range of artists/toys being made, is that reflected in your own collections? Or does it force you to stick to something more narrow in scope, just so you don’t go broke? Gary – My collection has always included quite a broad range of artists and styles. I obviously have my favourites in my collection – JPK, mcbess, Huck Gee & Jesse Hernandez – but you’ll find a whole bunch of incredible smaller artists like Uncle Absinthe (www.facebook.com/uncleabsintheart), Molly Bolder (https://www.behance.net/gallery/15951467/The-White-Hare) & Mullet (www.instagram.com/shitnsick) in there too. Getting to see the awesome selection of artists sending The Toy Chronicle information, on their releases, has definitely helped me to add newer artists in to my collection. Andy – Very good question! Since I have been blogging, my collection has changed a lot. It is more diverse, more resin toys & custom toys. Why resin and custom toys? For me it has been blessed with the actual artist brush strokes or sculpting. Production toys will always have a part in my collection, but I am more selective on what I buy. I love toy photography, so when I blog I find it hard to resist to think what toy from an artist would look good in a set up etc. Narrowing my scope for me personally is one epic fail. 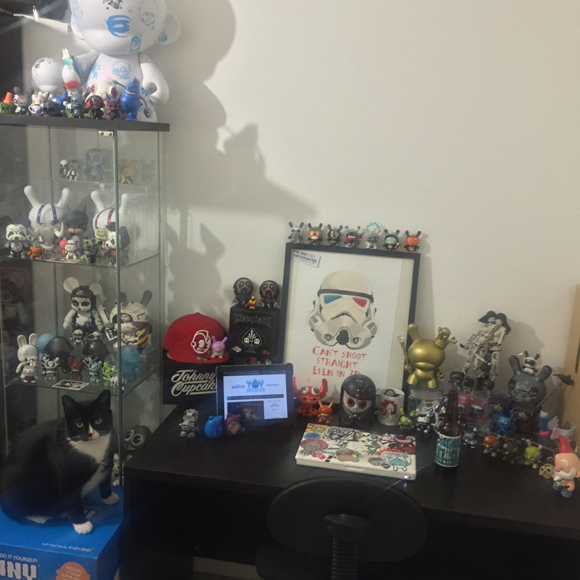 Speaking of collections, we asked the boys at The Toy Chronicle to give us a few images of their collection and work spaces, and here we go! We would like to thank these forum members for helping with some of the questions: Pause, thekrazyness, megrimlock1, yardarm51, christopherwalls, mak, jeffbayard, aBAYBAY, quest_ion, battlecat, and nothing371 (eveyone likes you).